What are your renewable energy goals and how can you make them happen? Are you seeking to lower your monthly electric bill? Help fight climate change by switching to renewable energy for your home or business? Or, are you just angry and disappointed that our current Administration in Washington D.C. ignores (and in some cases, flat-out denies) climate change and you just want to DO SOMETHING about it? We hear you! Powering Paradise is a Safe Energy Project initiative of the World Business Academy that is about educating, assisting and referring people to resources so they can go solar and/or acquire a power backup source for their home or business in case of an electricity blackout, power emergency, or weather disaster. Collectively, we need to set an example, right here in Santa Barbara. Let us help you be a part of the move toward clean and renewable energy. When you register for Powering Paradise, our project director, Cynthia Wallace, interviews you to learn your goals. Whether you are interested in solar or backup power (or both), Cynthia will refer you to the best local contractor for your unique needs who will provide free energy consultations and project estimates. As a public service, the Academy assists throughout the project to help keep things on track and make sure people receive high-quality service. 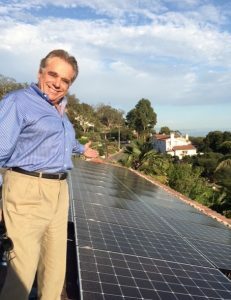 Academy Founder Rinaldo S. Brutoco will personally vouch for going solar, as he installed solar panels at his Santa Barbara home in 2016. Save money on your energy costs. Everyone who installs solar saves money on power over the lifetime of their solar system. Financing options are available and people will see energy savings their very first year. Benefit from renewable energy tax credits. Solar installations, and battery backup systems integrated with solar, are currently eligible for federal tax credits in the amount of 30 percent of the total system cost. This represents thousands of dollars in direct savings. Do your part to fight climate change by taking action. Many property owners who can easily afford to pay their electric bills install solar because they want to contribute to the production of clean, renewable energy. Be prepared for an emergency, power outage or a weather disaster with a backup power system. The Thomas Fire and Montecito mudslide demonstrated that climate change is in our backyard. A backup power source will keep the lights on and your refrigerator running! The risk to our energy in Santa Barbara County is another critical reason to install solar. South Santa Barbara County is connected to a compromised energy delivery system, leaving people vulnerable to extended, catastrophic energy shortages. The vast majority of our power travels 50 miles from the Santa Clara substation, across rugged terrain and remote mountains, and is carried by a single pair of high voltage transmission lines. The towers carrying these transmission lines are antiquated and face a high risk of destruction from wildfires, storms, mudslides and earthquakes. If even a single tower were to collapse, Santa Barbara residents could be plunged into darkness for a very long time. Southern California Edison identified this disastrous vulnerability in its power transmission system in 2014. According to a report submitted to the Public Utilities Commission, if a transmission tower goes down, all 82,700 metered customers in South Santa Barbara County will lose power until emergency power can be delivered to the area. A repair or replacement could take weeks or even longer. But if you have solar and a backup power source, you’ll still have electricity. Register for Powering Paradise today. Feel free to contact Cynthia at 805-892-4600 or email her at [email protected]. Join us and your fellow Santa Barbarans as we take responsibility for our community and become a positive role model for the world.